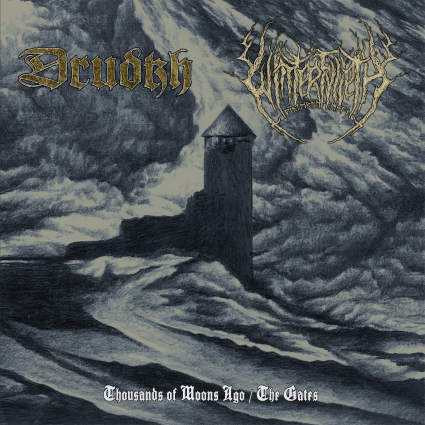 As you read these words, chances are this limited split 12” by Drudkh and Winterfylleth is close to being out of print, if it isn’t already. It is a covers album with both Drudkh and Winterfylleth paying homage to Eastern European bands. Even though I find releases such as this are often forgettable, Both creative entities on this split have unleashed a fitting tribute, while somehow making each of these songs their own. Roman Saenko is an insanely busy musician and musical visionary if you will that has turned out countless releases in many different projects, all of which have exhibited a level of quality that is inspiring and rare. It is common for a songwriter to start off their career with their most focused and inspired material as they have been working on it the longest and have the investment of time and heart behind it. Drudkh is likely his most coveted and popular band and as this project has unfolded, the albums started out great, and became amazing as the band has progressed. To this day, there are moments on Blood in our Wells and Estrangement that can bring a tear to my eyes if in the right frame of mind, and even though I see the latter release as his creative apex, Drudkh hasn’t unveiled a bad album. But, there has been a minor stylistic shift. Handful of Stars featured more of a polished production and less of an emotive impact for me which was always the defining characteristic that Drudkh had nurtured since their inception. Eternal Turn of the Wheel focused more on speed and aggression. Yes the overall sound was clearly Drudkh and the album enjoyable, but I found myself more drawn to the bands earlier works for the heady visions and emotive trip that I had come accustomed to when spending quality time with this music. 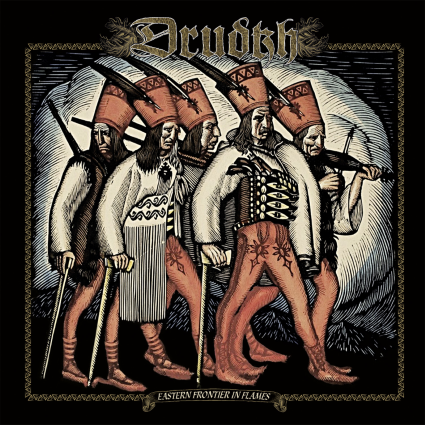 Thousands of Moons Ago is a tribute piece featuring covers from Hefeystos, Unclean and Sacrilegium, but Drudkh have approached this material as if it were their own making it feel stylistically like a nice mix of Drudk’s stylistic eras and a comfortable zone for them to inhabit. Tracks like Recidivus (A Sacrilegium song and my favorite on here) dig in with a lumbering and dreary atmosphere right along side tension inducing speed. The mix feels balanced, though I tend to gravitate towards those open moments of music when you can experience impressive/moving bass lines held aloft by such skillful and airy synth work. The harsh soul scaring vocals of Thurios (Also known for his work in Astrofaes, Hate Forest, Blood of Kingu and others) remain unique in their earthen/moss covered delivery and it helps to define the undeniable sound and identity of Drudkh. 3 songs for their side of the split and the attention to detail and interesting drum work/musical twists allows this material to hold up extremely well and inspire me to give the original bands covered, none of which I have heard before, my undivided attention. Having trouble completing your Drudkh discography due to insane Ebay prices and having to endure inflated heating bills thanks to this accursed “Arctic Vortex” we have been enduring? Fear not thy cult completists, for the kind souls over at Season of Mist have done the legwork for you with Eastern Frontier in Flames! ~ by martyworm on January 8, 2014. Ah yes, great news! I pretty much worship a lot of the black art Saenko and Thurios have created and new (although it is old) Drudkh material is always welcome. Totally agree with you on those unique vocals, they’re so powerful they’re scary! This entry was posted on January 8, 2014 at 8:28 pm and is filed under ALL REVIEWS, D-reviews.You can follow any responses to this entry through the RSS 2.0 feed.You can leave a response, or trackback from your own site.